Postal delivery: This closure has had impacts on the community in other respects, the Royal Mail postmen brought mail for Woodborough residents from Arnold to Woodborough and did the ‘final mile’ sorting in a room to the rear of the premises. Now sorting is done at Arnold, this has the effect of post and parcels normally available for collection at the Woodborough PO now having to be collected from Arnold. Medical prescription service: For many years the medical centre at the Calverton Practice, approximately two miles away, would leave at the Woodborough Post Office repeat prescriptions for those residents eligible for this service to collects. Those same residents could also leave repeat prescription orders at the PO counter for regular collection by the Calverton Practice. The Practice has been quick to organise and pilot a delivery service of prescriptions direct to the homes of Woodborough residents. They are also encouraging more residents to register for the online ordering service. Newspapers & magazines: From the 17th July a Cotgrave newsagent stepped in to deliver newspapers and magazines to Woodborough. Two services were immediately available, firstly to those residents who had a shop save service, their papers and magazines can be collected from Sue & Harold Lobley’s home in Holme Close. Sue has worked at the former paper shop for 23 years. The other service that the Cotgrave shop has been able to maintain are the paper rounds to local residents. What of the future: There are already a number of rumours as to what if anything might happen. 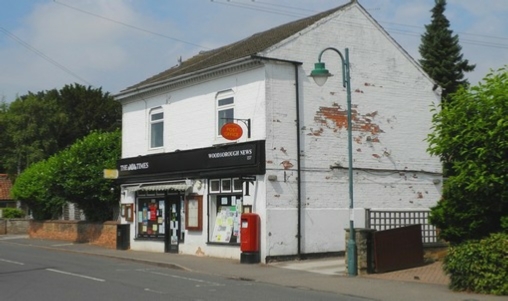 Two facts have immerged, one the premises are up for sale, two a letter was sent from the Post Office local Head Office on the 17th July to the secretary of Woodborough Parish Council, in that letter it refers to the “temporary closure” and that the Post Office “are currently investigating the options available which will enable us to re-instate a Post Office service to the local community”. The letter was signed off by Andy Paling, Field Change Officer. So there is some optimism: In light of the very short notice of the shop and PO closing, several people have been quick to react in order that some of the services residents have been accustomed to are maintained. In particular, Calverton Medical Practice, Cotgrave Post & News Shop coupled with Sue & Harold. The Post Office are looking at the possibilities or re-instating a Post Office of some kind back in Woodborough, and finally our ‘Posties’ for adapting to the unexpected changes forced upon them and maintaining seamlessly our postal deliveries. After a long process, we have now got the keys to the Woodborough shop and we are happy to confirm that we are the proud owners. The premises require a complete overhaul and renovation and we are delighted that FC7 (Simon Hill & Jenna Frudd), a local building firm, have taken on the project. Our intention is to open the premises as a shop and post office to serve the community. We shall remain as landlords only, and if anyone is interested in taking on the business which has huge potential, please contact Noreen on nasadiq@hotmail.co.uk. The shop will only be successful with the backing of the community and we would really appreciate all your support. We will keep you informed of the works progress including an opening date as soon as we can. Many thanks for your patience and we look forward to seeing the shop up and running, and serving the community with a smile and a warm welcome soon. Great news for Woodborough residents. Following substantial renovations and improvements to the property on Main Street over the last two years by the Sadiq family, a new SPAR shop and post office opened for business on 26th October 2016. It is a lovely well stocked shop and we wish the proprietor Mr Farhad Sidiki every success. The demise of the Main Street Post Office & shop: Customers of the shop and Post Office were first told of the impending closure on Tuesday the 15th July 2014, indeed the premises closed only 2 days later at 5pm on the afternoon of the 17th. So this is the point when both businesses ceased trading. It appears that this closure was forced on the tenant traders as they themselves were given very little notice to vacate. Only two weeks earlier a new facade was added to the front of the premises above and across both windows, the one you see in the photograph above. The building and window displays already look forlorn and lifeless. The footfall along Main Street is now insignificant with few people greeting each other and standing for a chat. This closure means for the first time since records have been kept, which is almost certainly a period of over 200 years, there are no shops trading in Woodborough.